Aniqa Nawabi (left), Executive Director of the Muslim Community Network, and Ana Aguilar (right), NICU Assistant Director of Clinical Services at NYC Health + Hospitals/Bellevue, discuss ways to support family members of NICU patients, while Kujegi Camara (background, center), Community Education and Interfaith Coordinator for the Muslim Community Network, greets a guest. January marks the one-year anniversary of monthly visits by volunteers from the Muslim Community Network to visit and support the parents, siblings, and other family members of premature and critically ill infants in the Barbara P. Gimbel Neonatal Intensive Care Unit (NICU) at NYC Health + Hospitals/Bellevue. Since the Muslim Community Network’s commitment began, its volunteers have assisted more than 100 families of patients, providing welcome support to parents going through the difficult experience of having a tiny, newborn baby in the hospital. Volunteers help parents by bringing hot meals, offering activities to pass the time, and perhaps most importantly, providing comfort and moral support. Over the past year, the volunteers have provided more than 360 warm meals to families, as well as to hospital staff. The parent of a NICU patient decorates clothing donated for her child. It’s one of the many activities the Muslim Community Network holds for parents whose children are in the NICU. This month NYC Health + Hospitals/Bellevue and the Muslim Community Network will mark one year of the visits, which began in January 2018. The initiative was coordinated by one of the hospital’s Community Advisory Board (CAB) members, Ahsia Badi. The MCN is a 15-year-old non-profit organization that is dedicated to changing the public narrative on what it means to be Muslim in America. 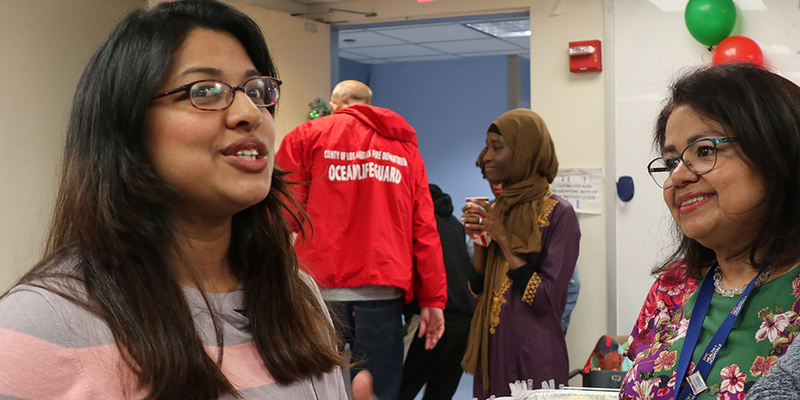 MCN informs the public and policymakers about their fellow Muslim neighbors and fosters the civic leadership of Muslim community members through volunteerism, youth organizing, and interfaith bridge building. The state-of-the-art Barbara P. Gimbel Neonatal Intensive Care Unit at NYC Health + Hospitals/Bellevue was created in 2011, named to honor the co-founder of the Children of Bellevue auxiliary, a non-profit organization supporting the pediatric patients at NYC Health + Hospitals/Bellevue. The 25-bed NICU uses modern equipment and technology and is designed to mimic the nurturing environment of a mother’s womb. Parents and family members in the NICU are provided with extra space at bedside and have access to a family lounge, dining area, and shower services. NICU staff provide care and answer questions 24 hours a day. For information about or an appointment at the Barbara P. Gimbel Neonatal Intensive Care Unit at NYC Health + Hospitals/Bellevue, please call 212-562-5555. NYC Health + Hospitals/Bellevue is America’s oldest public hospital, established in 1736. Affiliated with the NYU School of Medicine, the 844-bed hospital is a major referral center for highly complex cases, with its 6,000 employees including highly skilled, interdisciplinary clinical staff. It sees more than 110,000 emergency room visits and 500,000 outpatient visits annually. Clinical centers of excellence include: Emergency Medicine and Trauma Care; Cardiovascular Services; Designated Regional Perinatal Center and Neonatal Intensive Care Unit (ICU); Comprehensive Children’s Psychiatric Emergency Program; and Cancer Services. For more information, visit www.nychealthandhospitals.org/bellevue or find us on twitter.com/BellevueHosp. NYC Health + Hospitals is the largest public health care system in the nation serving more than a million New Yorkers annually in more than 70 patient care locations across the city’s five boroughs. A robust network of outpatient, neighborhood-based primary and specialty care centers anchors care coordination with the system’s trauma centers, nursing homes, post-acute care centers, home care agency, and MetroPlus health plan—all supported by 11 essential hospitals. Its diverse workforce of more than 42,000 employees is uniquely focused on empowering New Yorkers, without exception, to live the healthiest life possible. For more information, visit www.nychealthandhospitals.org and stay connected on Facebook at https://www.facebook.com/NYCHealthSystem or Twitter at @NYCHealthSystem.